Pointwise offers two approaches to handling dirty and complex geometry. The first approach is fault tolerant meshing, in which we mesh the geometry as is and then heal any problems on the mesh level. The second, newer approach is Solid Meshing. While importing CAD data into Pointwise, this technique creates models and quilts. Models are topological CAD entities that allow for watertight meshing over gaps and cracks in the underlying geometry. 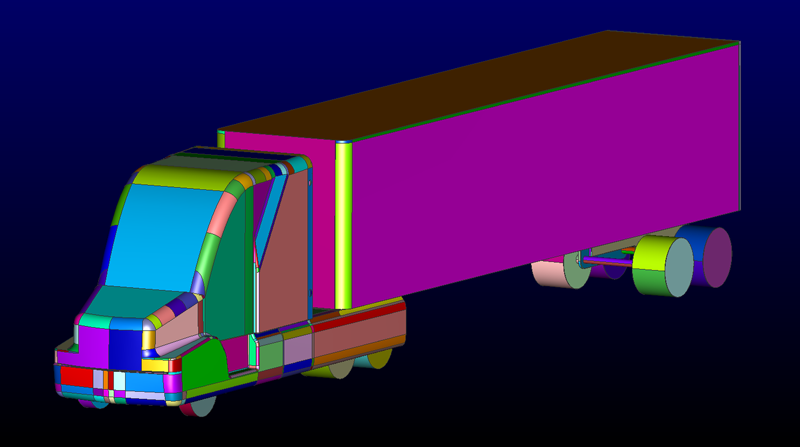 If importing geometry from a native CAD format that supports models, any pre-existing models will be imported as well. In addition to models, Pointwise includes the concept of meshing regions defined on the CAD level, also known as quilts. While a model is a watertight representation of the geometry, quilts are the regions within this model that hide unnecessary complex topology in the underlying geometry by identifying meshing region boundaries. Initially, each CAD surface is associated with a single quilt. As long as the quilts are in the same model, they can be joined into larger meshing regions. One misconception stems from the name “model”. When we say a model stitches surfaces together, we do not imply that the underlying surfaces are joined. In fact, the underlying surfaces remain untouched. A model is just another entity that shows how surfaces relate to one another. In other words, the geometry is just a collection of surfaces independent of one another. A model identifies how the surfaces fit together to make a watertight geometry, and a quilt identifies the collection of CAD surfaces that constitute a meshing region. Keep in mind that whereas models and quilts are the information that ties surfaces together and identifies meshing regions, they are database entities that live in Pointwise just as any other type of database entity. A quilt is a watertight meshing region. As its name implies, a meshing region only can be associated with a single domain. Just think one quilt = one domain. If a quilt spans multiple surfaces, so will its domain. Quilting reduces the surface mesh complexity and prevents skewed CAD surface topology from degrading grid quality. It does not simplify the underlying geometry, just the resulting surface mesh. One domain per quilt is beneficial because it gives users the ability to define regions that reflect the original engineering intent without destroying the watertight nature of the model. 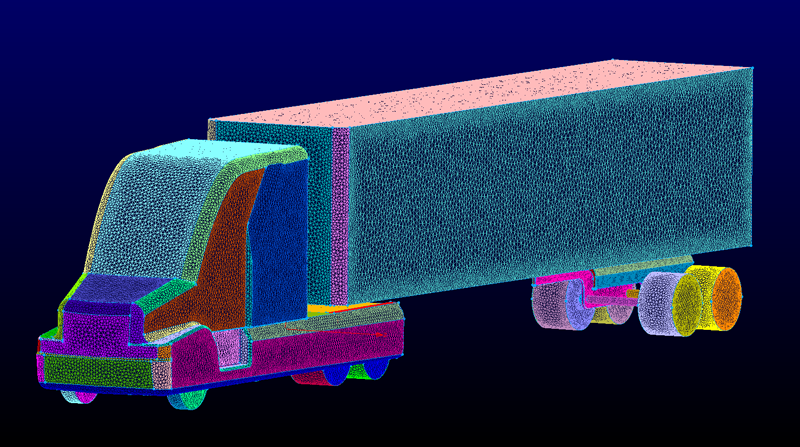 Fewer meshing regions not only simplify the working model but also more amenable to scripting. Quilts can be identified and named in Pointwise, allowing them to be directly called from within a Glyph script. As a general rule, if a geometry will be involved in a grid dependency study or will be used more than two or three times, it probably is best to invest time into cleaning up and simplifying the geometry using models and quilts. 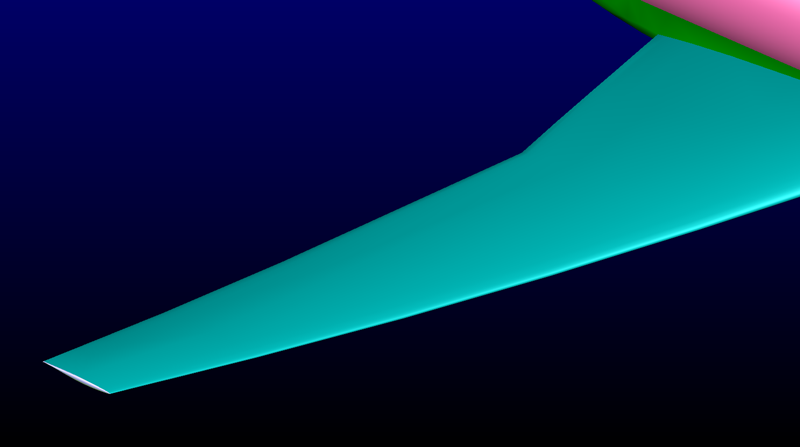 Imagine an aircraft wing, like the one shown in Figure 1, which consists of hundreds of surfaces. While these surfaces do in fact represent the CAD surface topology, they may be a result of the CAD software and not the original engineering intent. A watertight mesh can be constructed using these surfaces, but a more appropriate approach would be to use quilting to recover the physical surfaces of the wing. Figure 1: The 1,400 surfaces making up this wing do not reflect the original engineering intent. This is a perfect candidate for quilting. The hundreds of surfaces defining the wing geometry can be represented using only a handful of quilts (Figure 2). This reduces the number of database entities one would have to manage while recovering the engineering intent. And as long as the quilts belong to the same solid model, the resulting surface mesh will be watertight. 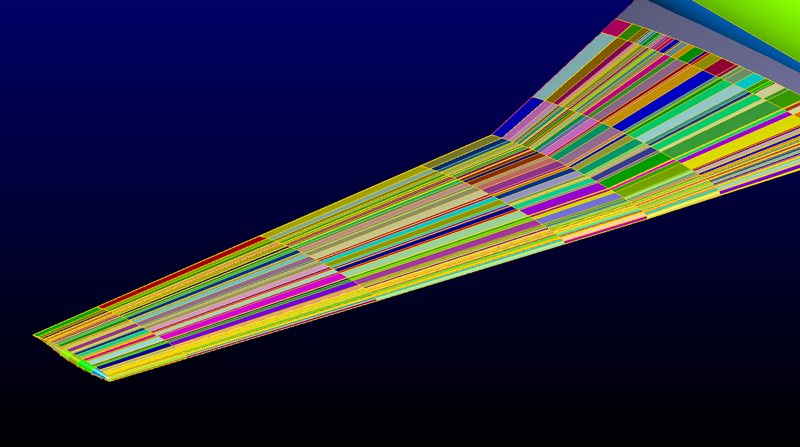 Figure 2: Only six quilts are required to fully define the meshing regions for this aircraft wing model. A slightly more advanced application is a full aircraft geometry. The NASA Common Research Model (CRM) is used for drag prediction studies and can be seen in Figure 3. By creating a single watertight solid model and associated quilts, the geometry was simplified enough to automate the mesh generation through a Glyph script. Note that quilts have been used to recover engineering surfaces such as the fuselage, fairing, wing, and tail. Hard edges in the geometry were preserved at the trailing edges of the wing and tail by placing quilt boundaries along these feature edges. Figure 3: A solid model of the NASA CRM benchmark geometry. The simplified model consists of 14 quilts that reflect the original engineering intent. Quilting reduces the overall number of database entities and simplifies the meshing process. However, as seen in the previous examples, it is advisable not to join quilts over hard edges or feature lines in the geometry. In other words, you want the edges of quilts to align with feature edges, not smooth them over. This prevents a single domain from being constructed over an edge and instead aligns the connectors with the edge to better resolve the actual geometry. 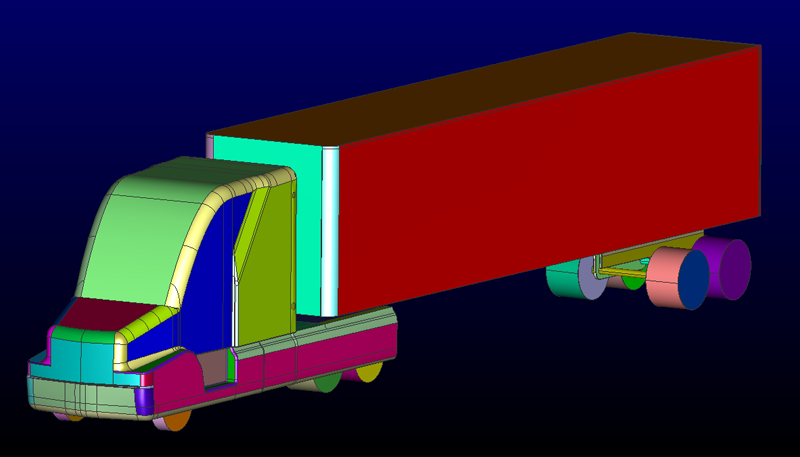 Another application that relies heavily on quilting is the Generic Conventional Model (GCM) semi truck and trailer. Upon import, the original geometry consists of roughly 600 quilts. Notice that even relatively flat, featureless regions are represented by numerous quilts, as seen in Figure 4. Figure 4: The original GCM semi truck and trailer geometry consisting of 621 quilts. By joining quilts into larger regions that represent the physical geometry, the number of quilts was reduced from 600 to approximately 100 (Figure 5). Other than making a conscious effort to preserve any hard edges in the underlying geometry, rounds also were isolated or removed. Although the boundaries of a round are smooth, the surface curvature is high. By isolating regions of high curvature, the edges of a domain are tasked with providing appropriate point distributions to capture the geometry, rather than relying on surface curvature refinement at arbitrary locations on the interior of a domain. This is a more efficient and precise way of distributing points to resolve both fillets and rounds. As for the removal of rounds, quilting can be used as a defeaturing tool. By joining smaller features with larger, nearby regions, the smaller features get washed out once a surface mesh is applied. Quilts on rounds near the trailer floor and roof, as well as the trailer tires, were joined with adjacent quilts. These features were small enough that removing them probably would not affect the solution. Figure 5: The GCM model simplified using solid meshing techniques. After quilting, only 113 meshing regions remained. With a much lower database count, the geometry easily can be managed and meshed quickly using Pointwise's automated surface meshing tools, as shown in Figure 6. Each quilt is meshed using a single domain, resulting in a collection of surface patches that represent the original geometry. Figure 6: Each quilt represents a meshing region. Here is the GCM model after surface meshing. Note there is one domain per quilt. A quilt is a Pointwise-specific database entity designed to represent a meshing region and make surface meshing simpler. Here are a few best practices for getting the most out of quilting. Use quilts to recover engineering intent and reduce the complexity of the model prior to surface meshing. Do not let a quilt traverse a hard edge you want to keep in the final grid. Preserve hard edges and feature lines in the geometry by making them quilt boundaries. Isolate regions of high curvature, such as fillets and rounds, to enable more precise control over mesh spacing. Over time, you may develop some quilting guidelines for your meshing applications, and we would like to hear about them. Send us your ideas at support@pointwise.com or on Twitter @Pointwise.